Congratulations to Maxim Lykov, EPT Kyiv Champion! Goodbye, Kyiv! A terrific week of poker in beautiful Kyiv, Ukraine is in the books. Kyiv's own Alexander Dovzhenko made a valiant effort, but came up just shy of taking the trophy, falling in the end to the man who ended each day with the chip lead since Day 2, Russia's Maxim Lykov. Lykov -- one of three Russians to make the eight-handed table -- carried a huge advantage into play today, his almost 2.6 million chips putting him nearly a million ahead of Vadim Markushevski of Belarus and Dovzhenko. All that changed quickly following a huge hand early on between Markushevski and Dovzhenko in which the Ukrainian picked up aces against Markushevski's kings. The aces held, and Markushevki was out in 8th. Suddenly Dovzhenko had seized the chip lead with over 3.8 million, a lead he'd keep the rest of the afternoon until after the dinner break. A couple of short stacks soon followed Markushevski to the rail -- Torsten Tent (Germany) in 7th, Adrian Schaap (Holland) in 6th -- followed later in the afternoon by a couple more chip-depleted players, Lucasz Plichta (Poland) in 5th and Arthur Simonyan (Russia) in 4th. When players returned from the dinner break, the gap between Dovzhenko and his two remaining competitors, Lykov and Vitaly Tolokonnikov (Russia), had closed considerably, with all three near the three million-chip mark. That changed quickly, however, when a preflop raising war got most of Lykov's stack in the middle and all of Tolokonnikov's. Lykov was racing with against Tolokonnikov's pocket sevens. An ace turned, no seven saved Tolokonnikov, and they were down to two. Lykov was the clear aggressor during the two dozen hands or so of heads-up play, claiming most hands with raises (or reraises) before the flop. Finally the Ukrainian picked a spot to push all of his chips in the middle with on a jack-high board. Unfortunately for him, there were two fours on board as well, fitting all too well with the four in Lykov's hand. 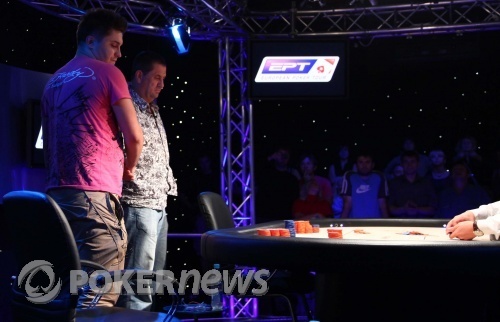 The river blanked out, and Lykov won the first EPT trophy of season six, plus that nifty €330,000 first prize. Thanks for following our coverage this week from Kyiv, Ukraine. And kudos to the tournament staff for pulling together a fantastic, memorable event on such short notice. Farewell from Kyiv! Next stop, Barcelona! Alexander Dovzhenko Eliminated in 2nd Place (€220,000); Maxim Lykov Wins the PokerStars.net EPT Kyiv (€330,000)! Maxim Lykov raised to 220,000 from the button, and Alexander Dovzhenko made the call from the big blind. With 440,000 chips in the pot, the two men saw the flop come down . Both players checked, and the turn card paired the board with the . Lykov checked again, and Dovzhenko quickly made a healthy bet of 400,000. "Raise," announced Lykov, slipping out a cool 1,000,000 in two tidy towers of orange chips. Dovzhenko didn't waste much time announcing, "All in," and Lykov shrugged his shoulders and quickly called, the tournament possibly mere moments from its conclusion! In a shocker, Dovzhenko's top pair had been rendered invalid by Lykov's third four on the turn. Drawing to just two outs with one card to come, the Ukrainian would find no salvation from the poker gods. The blank filled out the final board of the tournament, ending Dovzhenko's day just one spot short of a title he so desperately wanted to win for his home country. After a truly fantastic week of poker, Alexander Dovzhenko was swarmed by a crowd of his native supporters, taking home €220,000 as a consolation prize. Perhaps the betting favorite coming into the day, Russian Maxim Lykov has ridden a three-day chip lead to an EPT title here in the Season Six opener. 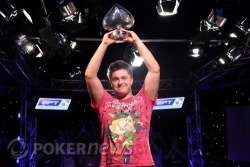 From all of us at PokerNews, congratulations to Maxim Lykov, PokerStars.net EPT Kyiv Champion! Maxim Lykov has continued his raising ways, having won the great majority of the first 20 hands of heads up play. Of course, thanks to that one big pot won by Dovzhenko, the chip stacks haven't changed much since they began. In most cases a single raise from Lykov is doing the job. Just now, Alexander Dovzhenko tried out a preflop raise from the small blind/button to 240,000, but Lykov came back with a reraise to 580,000 and Dovzhenko skedaddled. Alex Dovzhenko raised to 220,000 from the button, and Maxim Lykov made the call out of the big blind. The flop came out , and Lykov seized control with a leading bet of 250,000. Dovzhenko quickly called. Fourth street came the , and Lykov passed this time. Dovzhenko gathered 500,000 in orange chips and stacked them out carefully in the center of the table, his bet good enough to win the pot right there. Incidentally, once play reached heads up, the 5,000 (yellow) chips were raced off and the antes removed from play. Players are thus only contributing the 40,000 (small blind) and 80,000 (big blind) before preflop action begins. All In and a Call! 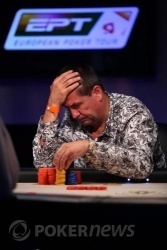 Alexander Dovzhenko limped in from the button for the first time in heads-up play. Maxim Lykov tapped the felt, and the cheap flop rolled out . Lykov checked, and he would call a quick bet of 100,000 from his opponent. The turn card was the , and the action went check-check. The last card off was the , and with it came all of the action. Lykov led out with a big overbet of 500,000, and Dovzhenko wasted little time announcing, "All in." Lykov quickly called too, possibly just one showdown away from an EPT title! But alas, the drama was short lived. Dovzhenko tabled , and Lykov's meant a split pot as both players rivered eights full. No chips change hands, and it's on to the next shuffle. First, Alexander Dovzhenko limped from the small blind/button, Maxim Lykov raised to 280,000, and Dovzhenko folded. Then, Lykov opened with a raise to 220,000, and Dovzhenko folded. Next, Dovzhenko limped again, Lykov raised to 280,000 again, and once more Dovzhenko let it go. From the button, Maxim Lykov raised to 220,000, and Alexander Dovzhenko came along with the call from the big blind. The flop showed up , and the action check-checked. Fourth street brought the , and Dovzhenko conspicuously glanced at his chips before tapping the felt again. Lykov checked behind once more, and the river fell the . Dovzhenko stacked out a bet of 350,000, and Lykov paused for just a quick second before making the call. Alexander Dovzhenko tabled for the nut flush, and that was plenty good to win him the first noteworthy pot of heads-up play. After a quick pause to reset the table and introduce the players to the crowd, the heads-up battle has begun! Courtesy of that knockout, Maxim Lykov currently enjoys about a two-to-one chip lead as the cards are in the air.